Instead of wearing a lot of pink, it has moved to purple. She learned all of her letters and started to learn to read. Maybe she will start reading to me from now on. She has learned to pout with arms crossed and head down. Fun! She is as sassy as they can get. I am started to learn to ignore her at times. She hasn't grown too much except for her feet (two sizes within 6 months). Though her brother can take her down pretty easily. Now on to my little give away. The winner is Angie of Angie's recipes! 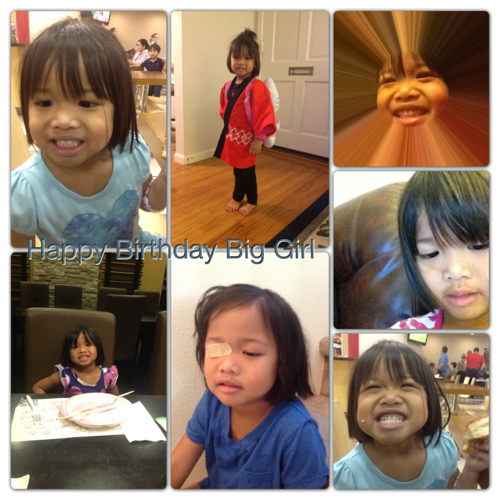 Happy happy Birthday to your little Angel! I like purple too. Thank you, Joy! You might not believe, but I have never owned a pizza pan ;-) this is totally cool! Belated birthday wishes to your little princess, she is cute. Love it.